definitely not a Texas summer, but more like a tropical paradise summer. I picked up these shorts at my all-time favorite thrift store in my hometown. around town with the boyfriend. I love outfit! Cute short! 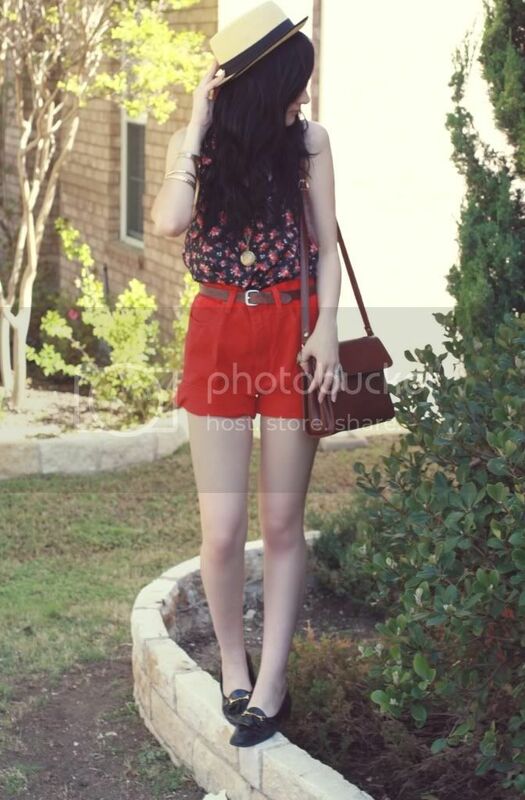 awesome summery outfit, i really love the sunshive, love your shorts - they're so cute and vibrant! The bag is gorgerous. But I love the whole outfit. so pretty! love the shorts and the floral print. your hat is pretty awesome too, lovely lady! Feels like summer in the Uk too! You look so perfect :) Really love your hat! This outfit is one of my favorites so far! I love red. It's been 85 degrees here in Charleston and I have no idea how to dress for the weather. Ooooh every floral things made for U! I guess! great outfit and fun colors! enjoy your adventure! 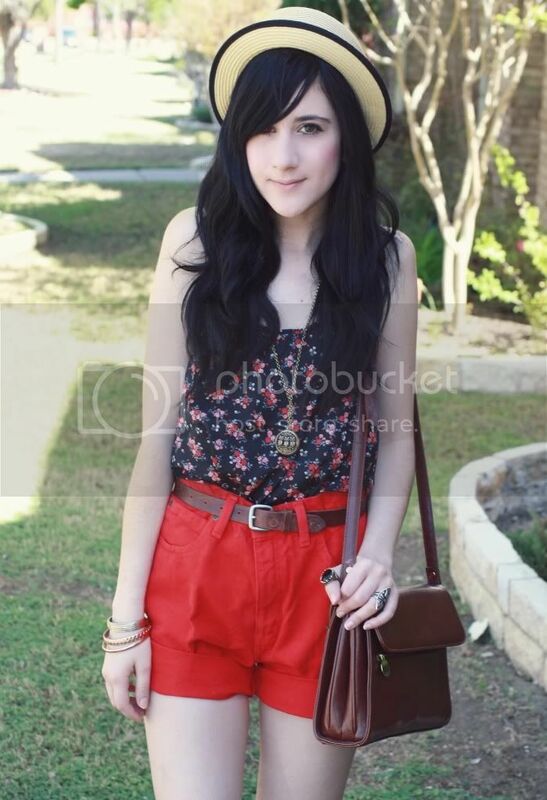 those shorts are so sweet..
wonderful look..i love your hat! Oh you look gorgeous as always. I love the bright pop of colour with the shorts. You are definitely inspiring me for my summer wardrobe. I just wish the snow would go away! I am so jealous of your weather my dear! Love those shorts, nice colour! It was warm here too (Belgium), but not warm enough to wear shorts...can't wait for summer! Those shorts are perfect on you and I love the hat! I'm so jealous - it is snowing a ton here in Minneapolis! such a cute outfit! love your shorts! Man, it's nuts how beautiful it is there! We're having a snow storm here in Ontario... I wish I was joking. Super cute outfit! I love your style. Oh gosh! And I was bragging my warm weather, your outfit totally tops it! Love the back of that top, red shorts never looked cuter! you loo kabsolutely beautiful! the hat maeks the otufit perfection ! and im jealous those shorts look so great on you. Amazing shorts, love the color. And you look cute as always Bonnie. Very cute. Love the back of the top and the shoes with shorts! Love the bright shorts, make me feel like summer is really here! the top is such a cute summer accessory too, we've been having some sunshine here and it's makes everything better. great style you have! Love the color red! i love the red shorts paired with that top! you are so lucky high waisted shorts look so good on you, they make me look all wide and weird!! It's so good to see someone in shorts and a vest, can't wait for Summer to wear mine. I love the brightly coloured shorts and adore the hat. I live in the Dallas area, and I love thrifting! Which store is your favorite? And don't forget to follow on Twitter for all the latest celebrity fashion news, from an LA stylist. Those shorts are perfect! These shots remind me of hazy summer days and I'm wishing for them even more! We had another snowstorm Monday. Ick. I am in Texas too, and when it was little cool yesterday am I cheered. I love spring but ick to hot and humid! Red shorts? Amazing and lovely! Aren't those shorts the perfect color! They look so killer on you! Hope you and Ryan are having fun! i love this! you are so pretty and the outfit looks amazing on you! especially the red shorts are brilliant..
love the shorts..<3...and i must say that thriftstore of yours is such a treasureplace..!!! wow, you have a beautiful blog! 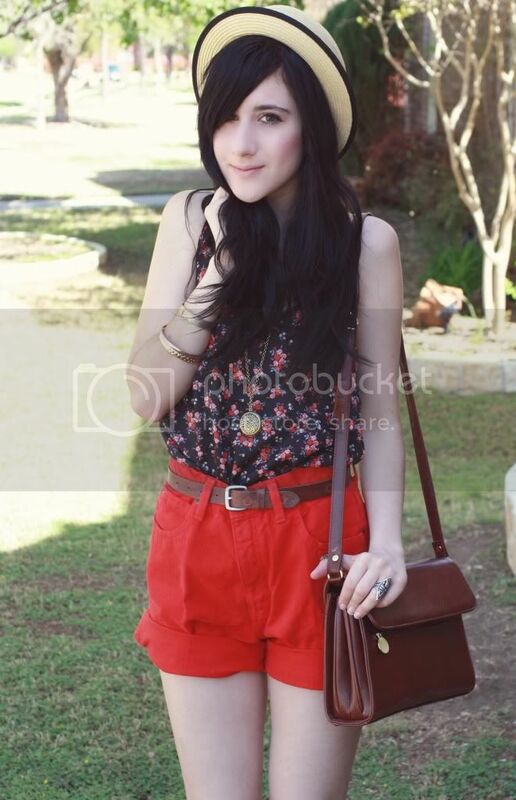 love your romantic chic style and the hat!!! You've got a new follower! This outfit is absolutely beautiful. I love the red! I adore this outfit! The bright red shorts are amazing!!! Those are some great thrift finds for sure and it makes me so happy to see some Spring outfits in action! You look amazing! Love the whole outfit! Wonderful outfit! The red looks so good on you. I love the hat and lovely shirt! Have fun on your adventure! You always have the best outfits. I love this from head to toe! Im so jealous of the top and those bright red shorts. Great find! Wow! 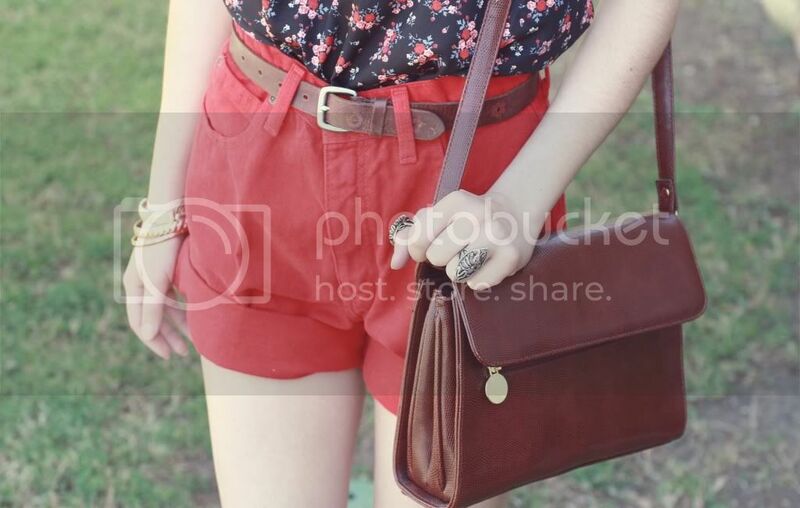 !this look is very nice...i like the mix brown leather with red pants!! are so cute...how are you? ?i hope fine. i am so jealous of everything you are wearing right now. it is still lion-like around here! I definitely need a pair of red shorts now! Great outfit! :) It was 91 Degrees here in Houston already! those shorts are SUCH a great find. & i'm jealous of your weather! all we've got is rain rain rain. So cute!! It's been raining here all week, but supposedly it'll be warm in a few days. I've already got my shorts ready to go! I'm so jealous of those shorts! And thrifted?? You lucky gal! They're absolutely beautiful!! I love it! i love this whole outfit. those shorts are lovely. i want weather like this! lol. ahhh bonnie you look like a doll here. so pretty. and i love your tank so much. perfect for your red shorts! Love your shorts and tee is awesome ! you look like a doll ! 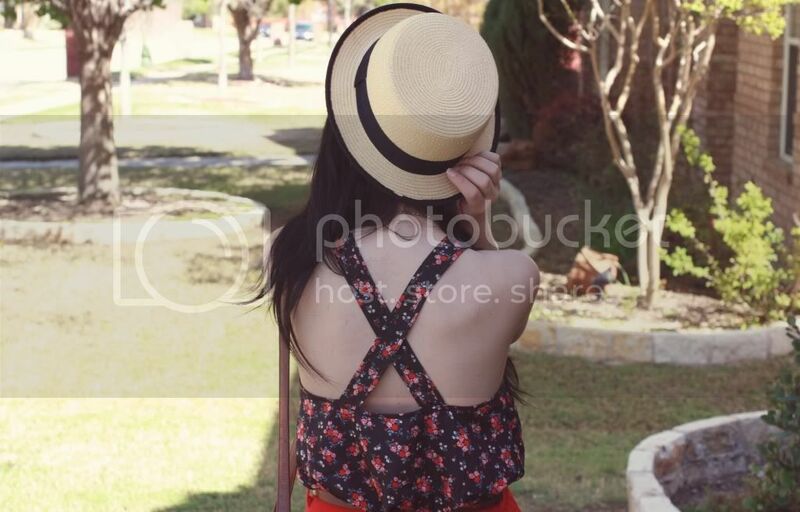 The weather is definitely heating up and this is the perfect outfit for it! Your top looks amazing. Especially with the red shorts. Great outfit. love the bag! x hivennn p.s enter my giveaway? wow, aaawesome outfit espech the hat! Seriously, summer feels like it's right around the corner! It's supposed to get up into the 90s on Saturday. Crazy. Love the outfit, those shorts were made for you! You just look so darn adorable, as always (: Jealous of the weather you have, seeing as Michigan has serious ADD in that department. Oh this outfit is absolutely adorable! It definitely feels like summer here in Texas. P.s. I just love your blog. And your name too, of course. Absolutely love those shorts. So amazing. Incredible colour! I love the bright red shorts! And that rectangular bag. You pull off that hat so well! this is so cute!!! love the look!! Hey I live in dallas! What is this thrift store you speak of?! :) I love thrift shopping! I really like your outfit! The red shorts are amazing! !